BAGHDAD (AP) — The Iraqi Shiite fighter's family is urging him to stop risking his life by traveling to Syria, saying he's done his part defending the holy shrine of Sayida Zeinab outside Damascus. Abu Mohammed al-Moussawi isn't listening. The 33-year-old father from southern Baghdad, who wears a ring inscribed with a Quranic verse, is preparing for his fourth mission later this month. He says he'll be issued an AK-47 from Syrian military caches once he gets there. "We are defending our religion," he told The Associated Press in a Baghdad cafe, insisting on a nom de guerre out of concern for his safety. "It's in our blood. It is a religious duty that we not keep silent when we see the Shiite holy shrines being attacked." Iraqi Shiite fighters like al-Moussawi are playing an increasingly prominent role in neighboring Syria's civil war, fighting alongside President Bashar Assad's forces against rebels. Their mobilization for Syria is exacerbating Iraq's own fraught sectarian tensions as violence between the country's Sunnis and Shiites spikes to its highest level in years. Shiite militias see the fight in both countries as the same: to protect their sect against Sunni extremists. 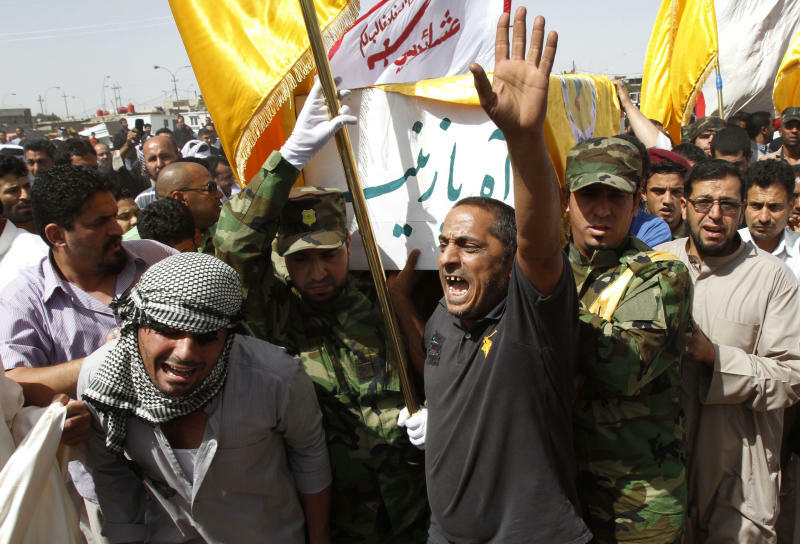 As more Iraqi Shiites make the journey to Syria, their comrades are becoming more assertive in Iraq, and the broader ideological struggle is heating up an already explosive political atmosphere back home. "The participation of Shiite militias in Syria under the pretext of protecting holy shrines is a sectarian project that is endangering the whole region," said Iraqi Sunni lawmaker Hamid al-Mutlaq. "The Iraqi government is turning a blind eye toward this." Iraq's Shiite-led government insists it has nothing to do with the stream of Shiite fighters heading there, and for months it has been warning about the threat posed by Sunni extremists in the fight for Syria. Sunni militants linked to al-Qaida's Iraqi branch have travelled to Syria to fight alongside the rebels, whose ranks include fellow Sunni militants from around the region. But Iraq's Shiite fighters have grown more open in proclaiming their role in Syria in recent weeks. In Iraq's southern Shiite heartland, mourners are increasingly gathering at public funerals for fighters who died fighting in Syria. At one held in Maysan province, along the border with Iran, for seven fallen militants, Iraqi soldiers provided protection as camouflage-clad militants carried flower-topped caskets through the streets. Two Iraqi militias — Asaib Ahl al-Haq and the Hezbollah Brigades, an Iranian-backed group that is independent of the better-known Lebanese Shiite militant group — are organizing much of the transfer of Iraqi fighters to Syria, according to Shiite politicians, clerics and militia members. Militia leaders send some recruits for training by members of Iran's Quds Force, which oversees external operations of the Iranian Revolutionary Guard, to a military camp in the Iranian town of Varamin before they are deployed to Syria, according to a senior official in the political bureau of the National Alliance — an Iraqi coalition of Shiite Islamist parties that includes al-Maliki's political bloc. He said others receive training in Lebanon. The official spoke on condition of anonymity because he was not authorized to discuss the matter publically. The Iraqis are joining other foreign fighters, mainly drawn from Lebanon's Hezbollah, supporting Syrian regime troops. Most of the Iraqis have been fighting in the area of Sayida Zeinab, a shrine on Damascus' outskirts revered by Shiites, where pro-regime forces have scored successes in pushing back rebels holding nearby suburbs of the capital. Jassim al-Jazairi, a member in the political bureau of Iraq's Hezbollah Brigades, said the fight in Syria was ultimately for the sake of Iraq's Shiites as well. "We feel that Iraq will be the next target after Syria. The Shiite groups, including our Brigades, are not fighting to defend the shrines only, but also against this Takfiri project in other places in Syria," he said, using a term for extremist Sunnis. Shiite militants' growing swagger over Syria comes as concerns mount that they are becoming more active in Iraq. In February, a little-known Shiite militant group left leaflets outside of Sunni households in religiously mixed areas of Baghdad telling them to leave — the first threat of its kind in years. Asaib Ahl a-Haq members last month held a rare public rally in a stadium in the Iraqi capital. Meanwhile, more than 100 people have been killed in bombings and shootings on Sunni mosques in recent weeks, and liquor stores and a brothel in a religiously mixed neighborhood have been attacked. While there has been no claim of responsibility for those attacks, Iraqis widely believe the attacks are the work of Shiite militias. The attacks come in a mounting wave of violence, including bombings by al-Qaida militants and attacks on Shiite pilgrims, that killed more 1,000 in May. More than 100 others have been killed in attacks so far this month. Qais al-Khazali, the head of Asaib Ahl al-Haq, characterized his group's involvement in Syria as a matter of self-interest. "Our existence does not depend on the survival of the Syrian regime. Yet we could be hurt and there might be sectarian strife" if Assad falls, he told Beirut-based Iraqi satellite channel al-Sumaria last week. 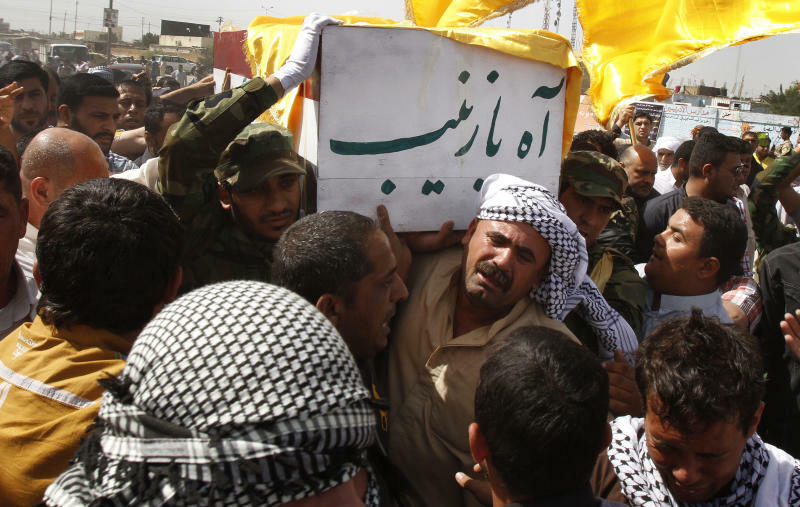 It is difficult to determine how many Shiite militants have gone to Syria. A senior Iraqi intelligence official estimated the number at a few hundred, though he said that figure does not include Iraqis living in Syria before the conflict there erupted. He spoke on condition of anonymity because he was not authorized to discuss the matter publicly. Militia leaders reached by The Associated Press declined to provide even a rough estimate of how many Iraqi fighters have traveled to Syria. Funerals have been held for more than 10 killed there have been held in recent weeks. Once in Syria, fighters are told to sever communications with family back home and to avoid carrying documents indicating they are from Iraq, the National Alliance official said. They are primarily fed into the Abu al-Fadhil al-Abbas Brigade, a Shiite militia led by Syrian Alawite commanders that has been promoting itself in YouTube videos and other postings online, he said. Iraq's Shiite clerical establishment has not publically released any edicts forbidding the militants' activities, which officials say have the backing of Iranian ayatollahs. A senior cleric in Najaf, the holy city that is the center of Iraq's Shiite clerical leadership, said officials there are avoiding issuing public statements endorsing the activities because they do not want to be seen as siding with a particular militant group. He did not have the authority to discuss the matter by name with journalists. Iraqis and foreign diplomats in Baghdad fear that sectarian-charged blowback from the Syrian conflict could metastasize into a broader regional battle drawn sharply along the sectarian lines that span Syria, Iraq and Lebanon. "The war in Syria has a direct impact on the situation in Iraq," said Waleed Mohammed, 44, a small businessman from the Shiite neighborhood of Sadr City. He blamed Iraqi Sunnis for the rise in Shiite militants fighting alongside Assad's troops in Syria, saying that they were supporting the rebels. "The Syria fight has added more tension to the political situation in Iraq," he said. Abdul-Karim al-Azami, a Sunni government employee in Baghdad, said he fears Iraq's minority Sunnis will pay a high price for the sectarian mobilization happening in Iraq as a result of the Syrian conflict. "All the fighters, from both sects, who went to fight in Syria are either mercenaries who are after money or narrow-minded people who are deceived by sectarian slogans," he said.